Fog can strike at the most unexpected places, causing massive accidents. Nellore district of Andhra Pradesh was recently witness to heavy fog in the early morning hours. 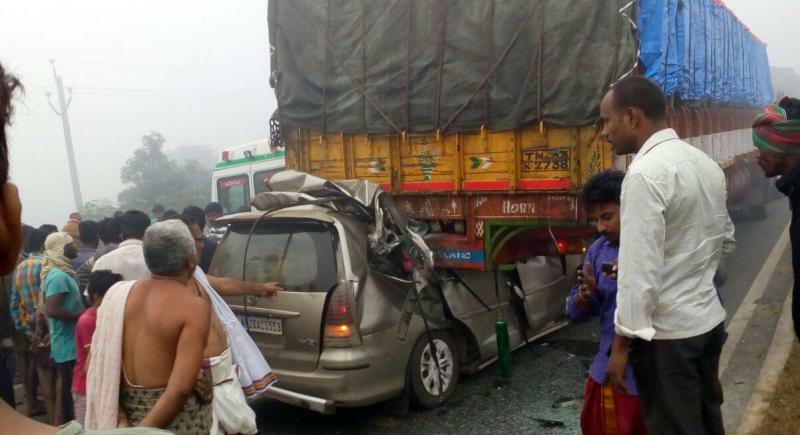 A Toyota Innova carrying pilgrims returning from Velankanni in Tamilnadu, crashed into a stationary truck in poor visibility conditions due to heavy fog. The accident happened on the NH16, near NTR Nagar under Nellore Rural Police limits. As the pictures indicate, the MPV driver seems to have driven straight into the parked truck on the four lane highway. The lack of under-run protection on the truck has resulted in the MPV going under the truck, killing three people instantly, and leaving two seriously injured. Another victim died at the hospital. Among those killed in this crash include M Narasamma (45), sarpanch of Venkanna Palle in TP Gudur mandal of Nellore district. The three other who died in this crash were the driver of the vehicle Hafiz (35), M Mallikarjuna (48) and Manjula (35). 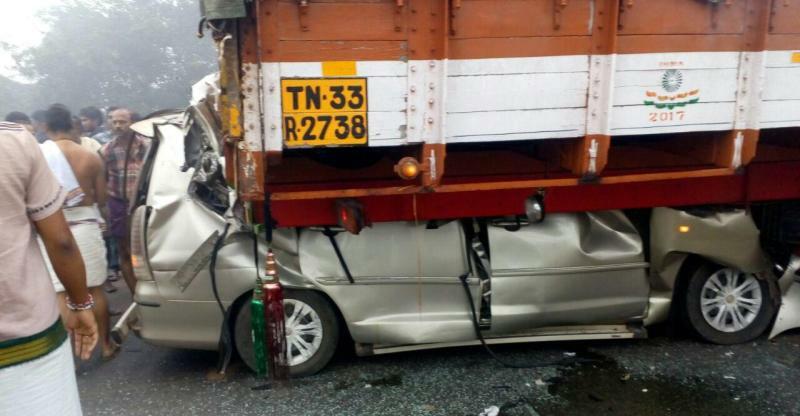 A case has been registered and police in Nellore district are investigating the accident. Driving in fog is very dangerous due to the sheer lack of visibility. It’s advisable not to travel on fogged up roads, and wait till the fog recedes. Should you have no option, make sure that you have a good set of fog lamps, and drive slowly, and very cautiously. Coming to parked trucks on highways, this is another highway hazard drivers should be on constant lookout for. Many truck drivers stop on the fast lane after breakdowns, with barely any warning signs places on the road. It’s not uncommon to see a few hastily assembled branches from nearby trees and even a large stone or two lying on the highway as warning markers of a breakdown ahead. Scan the road for these signs, and slow down as soon as you spot such signs. 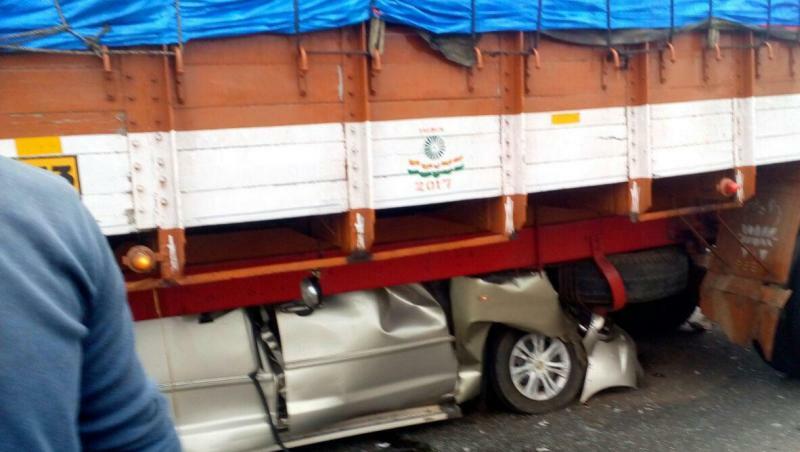 Finally, trucks without under-run protection continue to ply on Indian highways, endangering lives of fellow road users. This is exactly the case with this unfortunate crash as well. And India already has laws that make under-run protection mandatory on all commercial vehicles. It’s high time that authorities wake up to such dangers and enforce the law strictly. « 5 types of Maruti Ignis: Which is the right one for you?